Ubiquitous computing, anywhere anytime learning, personal devices—we have tools today that were unimaginable when some of us started teaching. In the old days of edtech every advance was miraculous, and it’s hard to believe now how limited some of that technology actually was. The first issue of Classroom Computer News (CCN), in the fall of 1980, heralded a new addition to the TRS-80 family of computers from Radio Shack: the TRS-80 Model III. It offered data storage up to 315K and was available in 4K, 16K, and 32K versions. Back then, 315K was a lot of storage and 32K was a lot of processing power. Today we measure in M.
That same issue of CNN featured discs as the “information storage medium of the ’80s.” There were two types—floppy and rigid. The front-page news in the following issue was Fujitsu’s low-cost, high-capacity disk drive that could store 84 megabytes; it cost $3795. Compare that to today’s USB flash drives; 8 gigabytes of memory to carry in your pocket costs $5.00 and you can have a 256-gigabyte drive for $89.00. New laptops have one terabyte of flash memory. In March 1989, Classroom Computer Learning (CCL) explained to readers how to “Enter Words and Pictures the Easy Way—Scan Them.” This article introduced “the world of scanners: what they are, how they work, and what you need to know before buying one.” Prices for a desktop scanner started at less than $2000. Optical character recognition (OCR) software was required to edit scanned documents. And do you remember fax machines? In the early 1980s, every school in New York City got one. Eventually they became inexpensive enough that anyone could buy one. Then multipurpose printers began including faxing as one of their tasks. How often do we fax documents today? Every month, CCL had a “What’s New” column featuring the latest tools and materials. In 1989, editors lauded printer sharing, a necessary but novel idea for schools with 300- dpi dot-matrix printers. They reviewed the Falcon Plus printer sharer for PCs and the Mac Plus Data Switch. 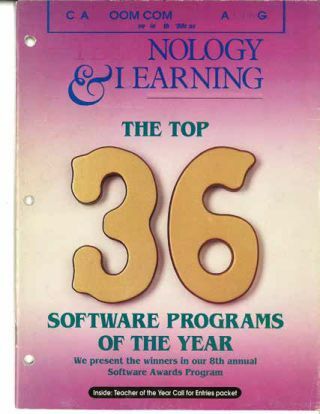 In that same issue, T&L’s “News Extra” announced Apple’s new notebook computers, new printers, a flatbed scanner, and the Mac Classic II, which would replace the SE30. Sales of Mac Classics that year outpaced the Apple IIe at the height of its popularity. Throughout the 1980s and 1990s, rapid advancements were made in technology for the classroom as well. Even in those days, edtech was about much more than computers. Do you remember overhead projectors with transparencies? Also called viewgraphs, they originated in France in the 1870s (yes, 1870s) and were used well into the 1980s. Teachers placed handwritten or printed transparencies face-up on a plate and a lens projected the illuminated image onto a screen or wall. In the 1980s–1990s, teachers used LCD projectors as part of their classroom computer display and projection systems. Teachers and students alike projected PowerPoint presentations from their computers using LCD projectors and traditional overhead projectors became obsolete. Document cameras were developed to project images of anything placed in their field of view, from images and maps to 3D objects. As the technology of video cameras and photographic equipment improved, document camera systems developed greater capabilities. Progressive scan cameras were introduced at the end of the 1990s. In 1991, SMART introduced an interactive whiteboard (IWB) called a SMART Board. The first in the field, it was simply an LCD screen attached to a computer. IWBs projected a computer screen onto the board’s surface, and teachers and students controlled the computer with a pen, finger, or stylus. At first, teachers with a single computer could create engaging presentations. Later, students began to use the technology for interactive learning experiences. They were able to run software and capture and save notes written on the whiteboard or on a graphics tablet. They could control the whiteboard from a PC and control the PC from a whiteboard. Rumor has it that clickers were invented in the 1960s to gauge audience response to motion pictures, television shows, and commercials. They appeared in college classrooms as early as 1998. Eventually they became easier to use and reliable and sophisticated enough for K–12 teachers to use them to collect, tabulate, analyze, and display data instantly. In August 2010, T&L interviewed school leaders to compare brands and use of these indispensable devices. Most of us use smartphones today, but a company called Palm Inc. pioneered the Palm handheld computers for classroom use years ago. Starting in 2002, T&L ran a series called “The Handheld Educator” to explain their use. One of the articles described these devices as “great learning tools that every student can carry around and great management tools that every teacher can carry around—in their hands.” T&L’s series included lessons in every content area and featured assessment and administrative applications. Using a pen or stylus and tablet instead of a traditional input device such as a keyboard, joystick, or mouse isn’t new either. When it was first introduced in the 1950s, pen computing, which predates the mouse and graphical display, used a pointing device and handwriting recognition. In 2011, a T&L review said, “AverPen combines the features of interactive whiteboard technologies in a mobile collaborative-learning solution—all usable with virtually any surface in the room. We’ve seen so much progress and so many cool tools for teaching and learning enter our classrooms in the past few decades. Computer access has changed too. We’ve gone from the one-computer classroom to one-to-one, from bulky desktop machines to laptops, netbooks, and tablets, and from computer labs to classroom devices to BYOD. What’s next? Maybe we’ll welcome watch and eyeglass computing or other wearable or even implantable technology as the next new thing. Gwen Solomon was senior analyst at the US Department of Education, director of The Well Connected Educator, and is the author of several books on edtech, including Web 2.0: How-to for Educators. She has been a contributing editor for Tech & Learning since 1998.